itelligence is an award-winning SAP Platinum Partner, providing a full service of SAP solutions, both cloud-based and on premise, for a range of businesses. They pride themselves on their broad range of capabilities – whether this be consulting, maintenance or managed services – in order to better equip business for growth and success in the future. We were tasked to generate highly targeted leads from users who had previously shown an interest in itelligence’s industry and/or services. By utilising itelligence’s existing industry content we were able to produce relevant and captivating content posts. 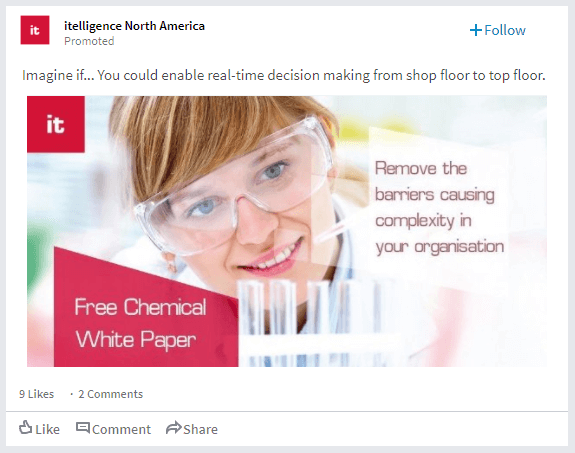 We promoted these posts through LinkedIn, targeting specific job roles within itelligence’s target companies. We chose to raise awareness via widespread Display campaigns, collecting data from click-throughs, as well as creating and promoting gated content. We used LinkedIn’s new Lead Gen Forms to ensure we were capturing user details, which also ensured that only those truly interested in the content fill it in. We used Sponsored Content on LinkedIn and Facebook to promote two surveys – one aimed at HR teams and the other at Finance customers. 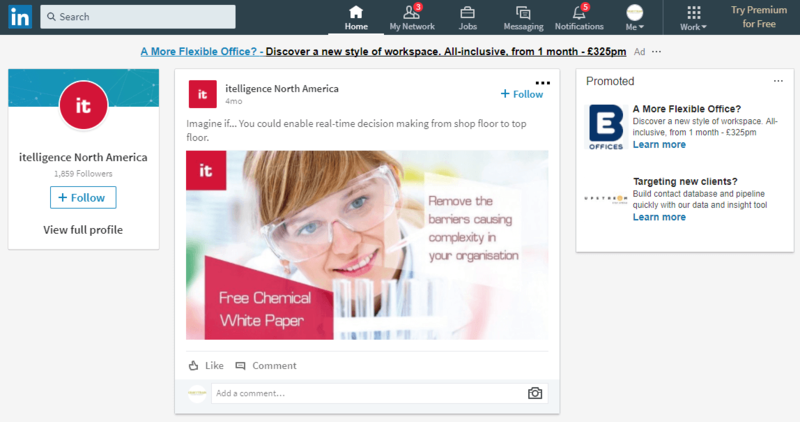 We utilised LinkedIn’s Sponsored Content alongside lead gen ad formats for these campaigns. We continuously optimised these ads and saw consistent results both in terms of month-on-month improvements and a decreasing cost-per-lead. This campaign was intended to target a specific audience within the chemicals industry. Initially, we utilised LinkedIn’s Audience Expansion tool to pull in similar users based on targeted criteria we had set. However, this watered down our targeting too much and brought in some irrelevant leads. We then altered this approach, resulting in several quality leads. 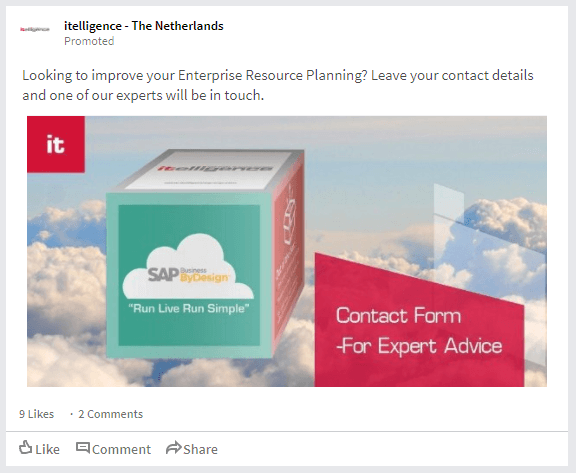 With this region, itelligence wanted us to re-engage people who had received a ByDesign package in the post, redirecting them back to a product-specific page. We approached this by working with Sponsored Content on LinkedIn, using Account Based Targeting. With the approaches listed above, we could collect a large number of high quality leads at a minimal cost. Our ongoing optimisations of the account have produced month-on-month improvements to conversion rates and CPA. These results enabled itelligence to expand their reach to an audience they had defined, making them more visible to their target demographic. This improved awareness of their brand, and helped them reach out to high turnover businesses that will benefit from their services, all at reduced costs.